A customer focused quality management system needs to be an essential part of IT to meet the required levels of service your business needs. IT is charged with providing an ever-increasing line of products and services to the business. In our nanosecond world the quality of those products and services is paramount. 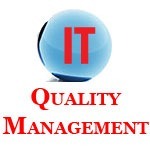 To meet the desired level of service quality management needs to become an essential part of IT. Many best practices have the goal of improving the quality of these services and products delivered by IT. They are essentially, quality management systems. There are certain basic principles of quality management that every best practice should follow. Just as the keys to successful IT Service Management is “It’s The People Stupid”, the keys to customer focused quality management is, “It’s the Customer Stupid”. The first principle in a quality management is to be customer focused. IT serves many customers, both internal and external. Each uses different products and services. Each will have different uses for those products. Each will have different requirements for those products and services. IT must meet the needs of everyone and to do this IT must be customer focused. There are four keys to becoming customer focused. Since quality management needs involvement of every person enlist your department heads to direct their managers to help in each of these steps for their department. The first step is to create a catalog of all of your products and services. In IT this catalog will be vast and should be broken down by department to simplify your system. This catalog should include any product or service that a department within IT produces. Products include data products such as reports. Services include tasks such as technical support. Now you must identify all of the internal and external customers who use your products and services. You need to go beyond “the business” as being a customer and identify the specific parts of the business you serve. Some services are used by everyone so you need to be smart about what to include. For instance your network infrastructure is the backbone of IT and everyone uses it. However some customers may have requirements such as increased bandwidth so you will need to identify them because they have specific requirements. Rich Schiesser is an article “Optimizing IT Customer Service” has some good tips on how to identify your customers. Now match your products and services to the the people or departments who use them. A key part of good customer focused service and a quality management system is defining the needs and requirements for all of your customers for each product or service they use. One may use a product or service differently than another. For example with a data product one may need a complete listing of IP addresses and locations for every router in your company. Another only needs a count of how many routers are used in the company. Same data source, but each customer has different needs. The best way to define the needs and requirements for each customer is to talk with them and ask them what services and products they use, how they use them and if they have special requirements. For off site customers and vendors you can create a survey form that can be emailed to them. Obviously you can not do this with every service and product. You are not going to email everyone in the company and ask them what their requirements are for the network infrastructure. You already know their requirement is a fast connection that is always there. Once again be smart about who you need to ask for requirements. Now you know who your customers are, what products and services they use and what their needs and requirements are. Providing outstanding customer service means you need to meet or exceed the expectations of each customer for each product or service they use. An IT department should do no less than meet the expectations of every customer. They should strive to exceed the expectations. Needs and requirements will change so you must stay in touch with your customers and update your products and services as needed. The ultimate goal is to find how to improve IT customer service. By aligning your IT products and services with your customers you will find not everything your produce is used. You may find A report that takes 15 minutes to produce for a DVP is deleted as soon as it hits their inbox because they no longer need it. You will be able to trim some products and even services and save valuable resources. By learning the needs and requirements for each customer you are better able to tailor them so they are more useful. A report may be missing important information the customer can use. You will provide better customer service and your customer will get more from what you do produce. Each customer has expectations. By meeting or exceeding their expectations you are providing excellent customer service. Your customers are more satisfied and better able to use your products and services. As an IT department you are more aligned with the needs of your customers so you do not waste time and resources. Read our eight part series on the principles your quality management system can be based on.